The thing to remember about the United States of America when it intermittently seems on the verge of civil war (metaphorically at least?) is that it is in the end a very complex place, full of many different real-world human beings. As one attractive example, Jill Lepore — Harvard University professor of American history and New Yorker magazine columnist —? was supposed to give her “End of Knowledge” contribution to the F.E.L. Priestly Memorial Lectures at University College in the University of Toronto around this time last year. But extreme late winter weather cancelled her flight from Boston. Her three “End of Knowledge lectures” — on “Facts,” “Numbers,” and “Data” in more or less chronological order — were put ahead to this past March 13, 14, and 15, 2018. Even this time a late-season blizzard in Boston came close to canceling the trip. Happily Ms. Lepore managed to catch a plane to Toronto the day before. 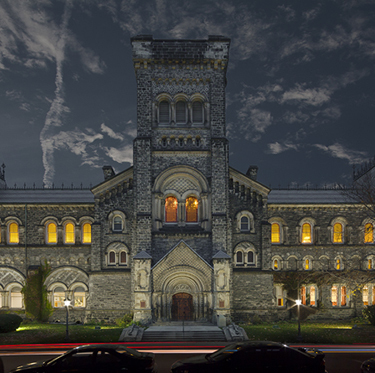 University College Toronto at night. I and I would guess most others who made their way to the venerable two-tier University College lecture hall called “UC 140” at 4:30 PM on Tuesday, Wednesday, and Thursday in the middle of March, found her late afternoon talks altogether worth the wait. Jill Lepore herself began her first talk with some brief thoughts about the attractions of spending time in older buildings on the downtown U of T campus — and how bringing together the academic community, a great variety of students, and curious citizens of the surrounding city (my own classification) was what finally made the “universe” of the university real. 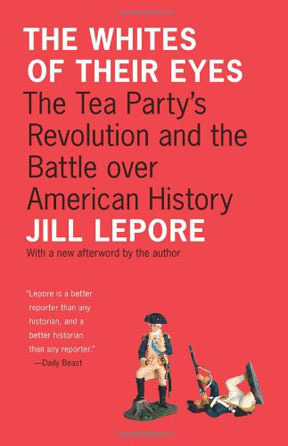 I should confess I knew about Jill Lepore’s work myself mostly through intermittently reading her New Yorker columns. I haven’t as yet read any of her books or articles in academic journals. Her well-deserved reputation, as best as I can make out, rests on her ability to bring the traditional humanist arts and crafts of the historian to bear on the increasingly high technological mysteries of contemporary society in the USA, and similar democratic places in other parts of today’s challenging global village (including of course Canada). In her three talks on how the evolution of? “Facts,” “Numbers,” and “Data” are leading to some new “End of Knowledge,” Ms Lepore also underlined that her intention was just to present a “provocation” to further helpful thinking about our current condition, rather than any finished? ?theory about what lies ahead. Among many other things, Jill Lepore has received awards for her undergraduate teaching at Harvard, and this shows in her public lecture style as well. As do many public lecturers today, I suppose, Ms Lepore also uses various visual aids to her talking. 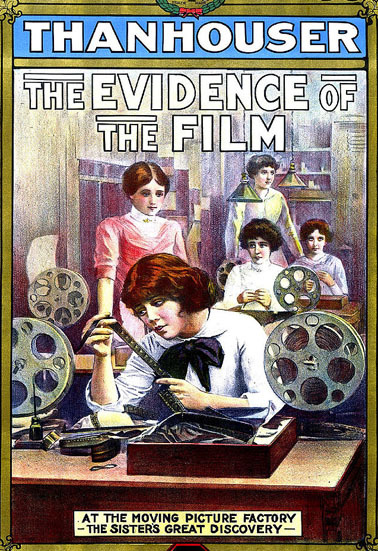 As an intermittent consumer of such events, however, I don’t think I have seen quite so many short clips from movies and TV helpfully offered as historical evidence before — from a 1913 short movie called “The Evidence of the Film,” to “Desk Set” with Katherine Hepburn and Spencer Tracy in 1957, to Stephen Colbert on “Truthiness” in 2005. 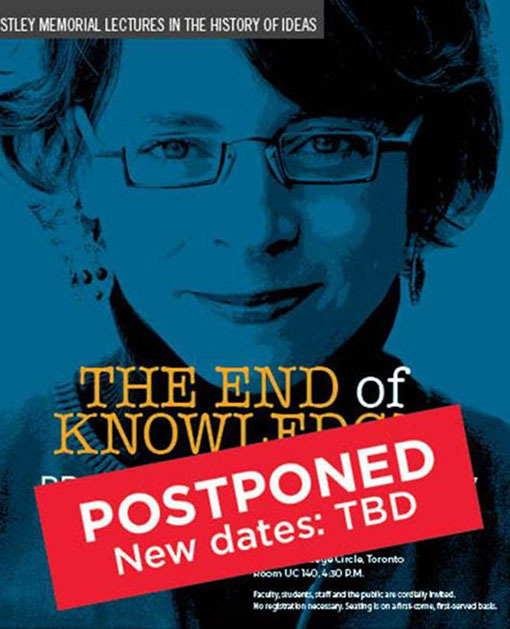 I am not at all sure that what I took from Jill Lepore’s three late winter 2018 Toronto talks on the “The End of Knowledge” is what she wants or expects from her audience. But I took something from what she had to say that I found helpful in my own haphazard thinking about the depths of our current condition. And that seemed in the spirit of her remarks. 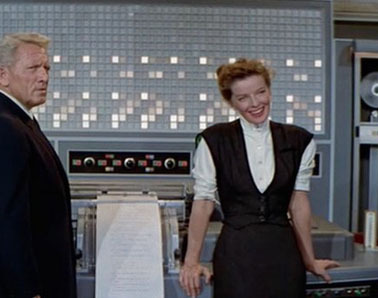 Spencer Tracy introduces the mainframe computer to old-school fact-checker queen Katherine Hepburn in Desk Set, 1957. * “Numbers” date from the Western European political and economic turbulence of the 17th and 18th centuries (from the English Civil War to the American War of Independence, in the anglophone countries). Modern democracy is all about numbers, Ms Lepore stresses. It is “rule by counting” (votes at elections in the ultimate case). * “Data” has some prefiguration with the birth of photography in the 19th century, but its age begins decisively with the birth of the UNIVAC mainframe computer not long after the Second World War, in the middle of the 20th century. And it culminates with the current era of high information technology dominated by the Internet, Google, and Silicon Valley. 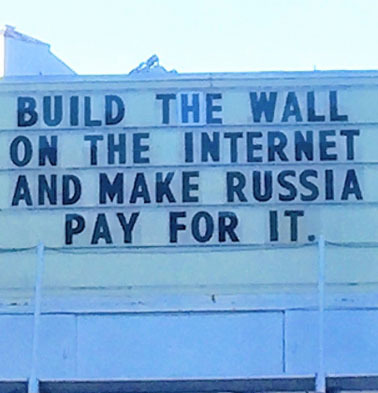 Jill Lepore has a photo of a San Francisco marquee of this sort with her "I Google therefore I am not" on it. 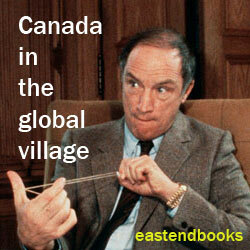 But this was the closest we could find on the net ourselves! At the other end of the options available, Ms. Lepore’s three lectures in Toronto apparently draw on her next book, These Truths: A History of the United States — available this coming September 2018 (in time for the US mid-term elections, as someone suggested). And my own best testimony to just how impressed I was by what she had to say on March 13, 14, and 15 in the same year is that I enthusiastically intend to buy and read this book in the fall (at last!). 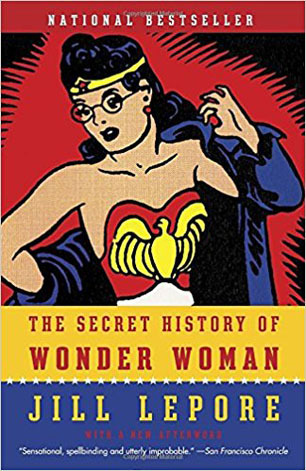 One of her more recent books is The Secret History of Wonder Woman (2014) — in which she explores “how this comic book character, created in 1941, remade American feminism,” while also offering “ a biography of Wonder Woman’s larger-than-life and vaguely creepy male creator, William Moulton Marston” (according to Dwight Garner in The New York Times). As the principal of University College in Toronto noted in introducing her at UC 140 last week, just to contemplate what Jill Lepore has done and continues to do with her time is to appreciate that she qualifies as a Wonder Woman in her own right. Consider the current public “Lectures” section of her space on the Harvard University website. Late this past November 2017 she talked at Princeton University in New Jersey on “American History from Beginning to End.” Then this past February 2018 she delivered what seem like parallel talks at the University of California, Irvine, and the Radcliffe Institute back at Harvard in Massachusetts. In March she has now been to University College in Toronto of course, and Case Western Reserve University in Cleveland as well. Then she’ll be at Elon College in North Carolina in April, and the Historical Society of Pennsylvania in Philadelphia in May. * From “Finding Louis Riel’s Voice, posted on May 9, 2016 by lnaus, Written by guest blogger, Max Hamon.” Hamon has found “a new archival document” on the Métis founder of Manitoba’s college days in Montreal. 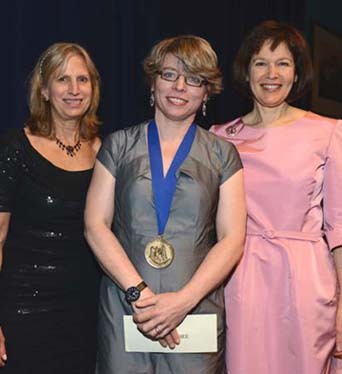 Jill Lepore (centre) receives 2015 American History Book Prize from New-York Historical Society for The Secret History of Wonder Woman. 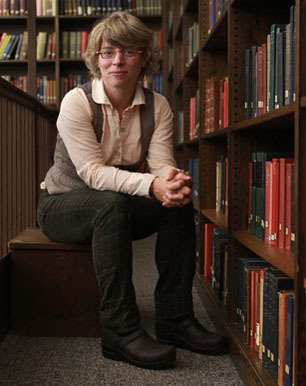 Jill Lepore in the stacks of her local research library : one of her favourite places, it seems. When she first discovered them as a student she burst into tears. I’ll conclude with a few brief notes on what I think Jill Lepore’s broad “political” message is at the moment (subject to change when I finally do read Đặt cược miễn phí ngay bây giờ 2019These Truths: A History of the United States this coming fall) … and what in all this I think I agree and disagree with myself! To start with, “The End of Knowledge” — or as blogger Mark Whelan has put it “the possibility that our ability to ‘know’ might be quickly slipping through our fingers” in a new age of high information technology (and alleged Russian witch hunts etc, etc, etc, etc)? — is of course an alarming proposition. And my sense is that, from her historical analysis, Jill Lepore believes democracy in America (and its other current and possibly future haunts) ought to be talking seriously about this prospect, and figuring out how to avoid or at least evade it. 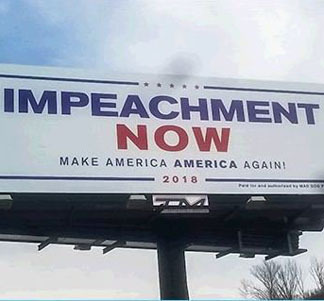 At the start of her three talks in Toronto she wondered aloud if her reflections in March 2018 might be a little darker than if she had given them as first planned in March 2017 (before any full consciousness of just how both crazy and serious the new age of Donald Trump in the USA today actually was had settled in?). In any case, around 5:15 PM on March 15, 2018 Jill Lepore was in too good a mood to entertain any too desperately depressing scenarios about future high technological dystopias. To me she? seemed to be saying that there is light at the end of the tunnel, if the old ages of facts and numbers can and will somehow stand up and refuse to be overwhelmed by the new age of data. This may seem too much like a minor vague aesthetic preference for the past over the future (if not necessarily the present) that virtually all of us who are in any way fascinated by history will in some degree share. Yet in Jill Lepore’s more sophisticated but still old-fashioned historical analysis, it seems to mean that seriously trying to understand (and appreciate) the human past in all its dark and bright parts can help us deal more effectively with the challenges of the present, and the future. At various points in her three talks in Toronto Ms Lepore did express some more ordinary aesthetic preferences for the attractions of (at least some) 19th century buildings in North America, 1930s to (say) 1970s movies (over, eg, “The Matrix,” 1999), and the smart, fact-checking women who dominated mainstream editorial processes in the 1950s. 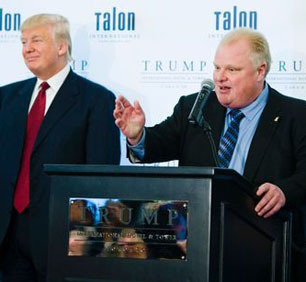 Donald Trump and Doug Ford’s younger brother Rob, highly controversial Mayor of Toronto 2010–2014. What I didn’t take from Jill Lepore’s “End of Knowledge” talks that I also feel myself is some compensating attraction to the more democratic, optimistic, and even romantic possibilities of the new information technologies of the Internet, Google, and Silicon Valley — at least as a means of bringing the twisted lessons of the past to some wider attention in the forgetful present. And that is just one of many reasons why I can’t see myself voting for him on June 7, when democracy in Canada’s most populous province of Ontario makes its own rule-by-counting decision, about who is going to be trying to run the provincial (ie “state”) government over the next few years. As far as I’m concerned, while there are a few important enough differences,? Doug Ford is finally on the wrong side of history, just like Donald Trump in the USA … And I’d guess that if Jill Lepore had time to worry about such? things, north of the North American Great Lakes, she would almost certainly agree.